Every great project starts with a blueprint. Lucky for you, we’ve laid out everything you need to know about building your bed in a simple, easy-to-read format. We draft our designs in order to give you the easiest route to your child’s dream bed. 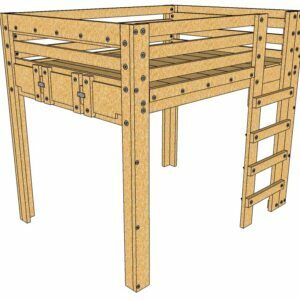 Our loft bed plans provide a fast, easy to follow outline for raising a queen size bed. We do the dirty work for you, laying out lengths, cuts, drill bits and fasteners so you can follow step-by-step instruction without wasting time. Our plans are formatted so that you’ll know exactly what you need before you start cutting and drilling. Every plan carefully details the materials and simple terminology you’ll need to get started. 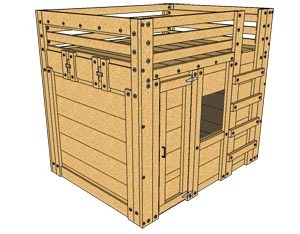 A customer favorite, our cabin bed plans can help you build your child’s dream cabin without the fuss. Plus, you won’t have to pay crazy in-store prices for a factory built bed that lacks the personality and customization that characterize our cabin beds. With both queen and twin size plans available, our cabin beds are perfect for weekend projects. Your child will be amazed when he or she sees a brand new cabin to call their bed. And not to mention, your new cabin bed will add a new dimension to your child’s room, doubling as a place to study or watch TV. Why our bunk bed plans? 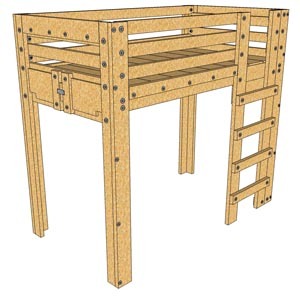 At PalmettoBunkBeds.com, our plans feature sturdy construction that will ensure your handy-work becomes a family heirloom. Additionally, we’re devoted to making beds that give your child more than just a place to sleep. Our cabin bed plans are built to provide endless entertainment for your child, and our loft bed plans are perfect for customizing a layered study space. Mom and dad will love our plans for how well they can fit into a happy, rounded lifestyle. Order one of our plans today – once you get started on the frame, you’ll never look back. Our bed plans provide a DIY project that will provide years of utility for both you and your child. 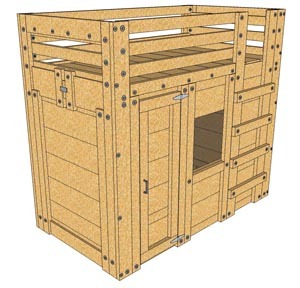 Check out our cabin beds and loft bed plans, and simply pay online when you’re ready to order. We’ll deliver an itemized set of directions straight to your inbox, so you can start building whenever you’re ready. The perfect bed for your child is just a few clicks away! Check out all of our bunk bed plans and order your favorite today!